Dubai Creek Harbour unveiled Address Harbour Point, a signature mixed-use project that celebrates waterfront living, with luxury homes opening to views of Burj Khalifa, the new Dubai Creek Tower and the historic creek. Serving as a visual gateway to the six-sqkm mega-development, the Address Harbour Point is a serviced residences and hotel project only 10 minutes from the Dubai International Airport. The towers are set by the historic creek and have a standout location by the edge of Dubai Creek Harbour’s Island District. They overlook the Ras Al Khor Wildlife Sanctuary, which is protected under the the Unesco Ramsar Convention and is home to over 67 species of water birds. The Address Harbour Point consists of two towers of 66 sand 54 storeys: one dedicated to serviced residences while the other hosts a hotel and serviced residences. 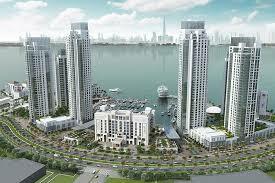 Both are operated by Address Hotels + Resorts, the premium luxury brand of Emaar Hospitality Group. The two towers are separated by a boulevard that traverses a marina, Island Park and the Harbour Point Pier. The boulevard is billed to be an integrated cultural, retail, leisure and waterfront destination. All serviced residences in Address Harbour Point are thoughtfully designed to maximise views. Emaar Properties will launch the sale of one-, two- and three-bedroom luxury apartments in Address Harbour Point today, at the Dubai Creek Harbour Sales Centre. Customers can visit the Dubai Creek Harbour sales pavilion in Ras Al Khor, Emaar Sales Centre at Downtown Dubai, the Dubai Hills Estate sales centre on Umm Suqeim Road and the Emaar sales centre in Abu Dhabi at Al Nahda Tower, for sales and enquiries.